If you didn’t get the memo . . . DETECTIVE CONAN IS NOW LEGALLY SIMULCASTING ON CRUNCHYROLL! They are calling it by the English title: Case Closed. So okay yeah, you might be jumping into Detective Conan at episode 754. No problem, do it, take the plunge! We are here to help you out. A series like Detective Conan can seem like an insurmountable wall that cannot be climbed by anyone other than most dedicated detective fans (or wastrels who have near infinite amounts of free time). The thing is, unlike shonen fighting series or dramas you don’t need to see every episode of Detective Conan to enjoy or follow it. But at the same time, if you just randomly tune-in you could find yourself lost or confused about the bigger stories at play. Thus this guide. What to know: Conan is so long running that remembering all the little details can be a challenge so we’re going to give you the most basic pieces that will allow you to start anywhere in the Conan library. 17-year-old Shinichi, already well-known as one of the best sleuths in Japan, one day runs afoul the Black Organization and is given an experimental poison that regresses him to elementary school age. He is forced to take the alias Conan Edogawa as he tries to find a cure for his condition and bring down the BO. Conan moves in with with former childhood friend Ran and her P.I. father Kogoro. Since Kogoro is rather incompetent, Conan is almost always forced to solves the cases and make it seem like Kogoro solved them instead. Conan has gadgets to knock out Korogo and impersonate his voice in his collection. Ran’s best friend Sonoko often gets involved in cases and Conan will sometimes knock her out if Korogo is not around. The “Detective Boys” (even though two are girls) are Conan’s friends in elementary school and consist of the lumbering Genta, timid Mitsuhiko, and cute Ayumi. Later, stoic Ai, a former member of the Black Organization who took the same drug as Conan to escape them, joins the group. These kids are often in toe with Conan and get into plenty of mischief. Dr. Agase provides all of the gadgets Conan uses throughout the series and is looking for a cure for Conan’s condition, he is good-natured, a bit daffy, and helps the kids in their adventures. He takes Ai in after she escapes the Black Organization. Conan often works with Inspector Megure. He is almost always seen with his trademark hat and trench coat. There are many other regular police officers who appear on and off in both the Tokyo police department and other law enforcement agencies but they usually serendipitously mention who they are to remind viewers. Heiji is the son of a police chief and also a teenage detective often considered on par with Shinichi. At first he is a rival, but the two become friends. Kaito Kid is a charming phantom thief who is one of Conan’s few criminal rivals. He is a jewel thief who doesn’t kill. 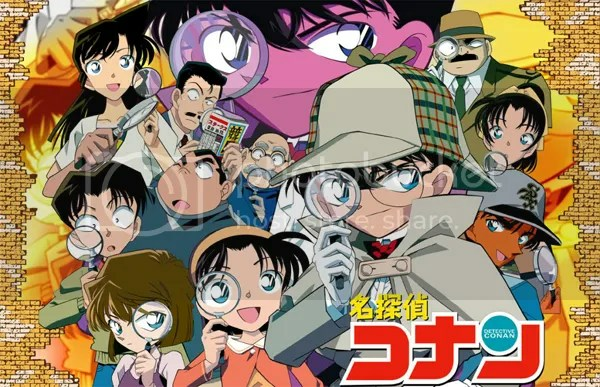 Major people who know Conan’s identity: Dr. Agase, Ai, Conan’s parents, and Heiji. The Black Organization is part of the central plot, viewers still only know minimal details about them. They are usually involved in some monstrous illegal activity that is tangentially related to a case Conan is involved with. All the high ranking members of the organization have code names based on alcohol. Conan is always on the lookout for the nefarious long-haired Gin who is responsible for Conan’s condition. BONUS: The Akai Family. This is relevant right now so we thought we’d include it eventhough it is getting into complicated territory. Sera-chan, the other teenage detective with Conan in the current story, is the younger sister of Shuichi Akai. Akai is an FBI agent who infiltrated the Black Organization, was outted, and faked his death; he is currently assuming the identity of Subaru Okiya. The Akai family also has a mysterious middle brother that we know very little about. What to expect: If you know Conan only by its name, there are few things to know about the show in order to really enjoy it and accept it for what it is. Detective Conan is a children’s show or more accurately a family show. Therefore it has a little bit for everyone, there are funny and child-wish-fulfillment moments for the kids and tense mystery and logic for the adults. In earlier seasons and films they recap the basic plot and characters of Conan at the beginning so you can jump in fairly easily. Also they often throw up name plates for characters both new and old. This has unfortunately stopped with newer additions to the series probably because they assume everyone knows Conan nowadays. Conan himself uses his sharp mind and attention to detail to solve the cases. He is a genius on the level of Sherlock Holmes so don’t expect to figure out everything in each mystery. In fact, it is a lot easier to determine who the culprit is (though still difficult) than their motive many times. Not every case is going to be epic. Some play out more mundanely than others and some can be downright goofy at times. But there are plenty of great head-scratchers. Conan uses super science, he has a ton of gadgets that help him through each episode, kind of like Batman. However, super science doesn’t solve the cases; the gadgets exist purely to buoy his being trapped in a 7-year-old’s body. All cases make a good effort to follow Knox’s Rules; while things outside the case can be affected by super science the actual facts of the case are not, nor is super science used to commit the crime. Sometimes the culprit is shown as a generic shadow figure, this is is no way representative of what the actual villain looks like. There is a variable level of violence in the series, each episode is different so you never know what you’ll get, how graphic it will be, or how macabre it will go. The series is fond of gruesome and grisly murders including decapitation. The overarching plot of Detective Conan comes in few and far between spurts. For example, the Black Organization appears in the first two episodes and not again for the rest of the first season. Our advice is don’t marathon this show or at least keep it under 10 episodes at a time. Some of the fun is removed from long viewings and you start to pick up on the formula of the episodes. Honestly, if we had the choice we wouldn’t start you at episode 754. Not that it is a bad little mystery, but it is missing a lot of the core players that appear most in the series. Remember, we are just giving you some of the broad strokes so you can jump in with Detective Conan whenever you feel like it. And you should feel like doing that right now! Are the name changes in the official English releases worth mentioning? Since this is more for watching the simulcast, I felt like no. Though I suppose I could at least say they are still calling it Case Closed on CR (GRRR!). Thanks! Pingback: Catching Up On Detective Conan: Season One (Region 1) | Nigorimasen!